Part of my on-going series of what to do with the peppers in your pepper patch. Today we look at a great appetizer that is as easy to make as turning on the burner on your stove. The shishito pepper is native to Asia as you might’ve guessed. Japan actually, where the name means “head of the lion” which is what the tip of the pepper looks like if you’ve had WAY too much sake. This is another relatively new addition to my pepper patch. I was unaware of their existence until we took a trip with my wife’s family to the Russian Valley wine country earlier this year. One day she came back from a vegetable stand with a bag of these thin, finger-length peppers that looked a lot like pepperoncinis which I had grown before. She sauted them with olive oil, salt and pepper and served them as appetizers during a Penguin Stanley Cup playoff game. They were just fantastic. So that’s what we’re going to do. I planted four plants, and I can pick enough peppers to make this dish once a week or so. Shishitos grow fast, to a length of about 2-3 inches. They are a light yellow-green in color, but will ripen to a bright red if left on the plant. I pick them green, but have eaten a few red ones. They seem to be a bit sweeter. The fruit is not hot AS A RULE. However, if you have them in a garden with hot peppers, about one in ten will be hot due to cross-pollination. And there is absolutely no way to know without biting into it. The one sure way to find a hot one is to offer one to my mother who can’t take anything hot. She will pick a hot one every time. I go to my plants and pick all the fruit over 2 inches long. I usually wind up with 20-30 peppers. They are easy to prepare for cooking as you do absolutely nothing. I don’t even take off the stems as these make handy handles when it comes time to eat them. Get a skillet, and put in a couple ounces of olive oil. After the oil is hot, put in the peppers. Salt and pepper liberally. Cook them for about 5 minutes until the sides start to brown. 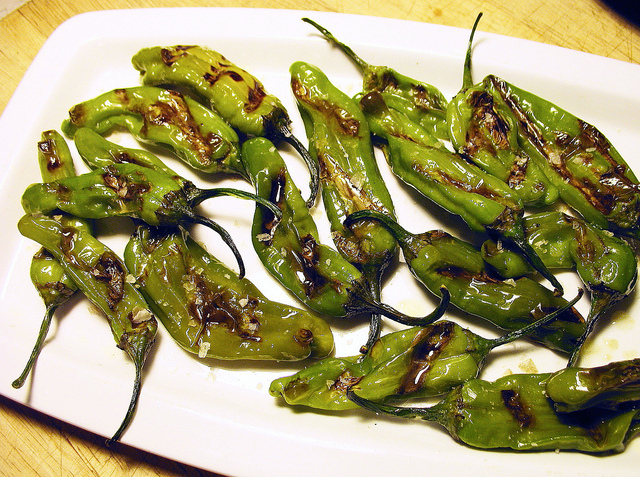 Be careful of the hot oil as some of the peppers may “pop” during cooking and splatter you. Turn them frequently to cook uniformly. And that’s it. Fish them out of the skillet and place them on a paper towel to soak up some (but not all) of the oil. They’re now ready to be handed around for appetizers. They will not last long. These are truly some of the easiest and best tasting things I’ve ever personally cooked. Sometimes, I don’t eat them all and have them the next day for breakfast. I just pop them into the microwave and they come out just about as good as the night before. So plant some of these and enjoy. I will be planting more next year I think.